Do you love seafood? Then you are sure to love salmon. It is one of the most popular fish that is sold all over the world. Europeans take it as their staple food. Even in America salmon is popular. It has lots of health benefits. Consuming salmon is very beneficial for the health of your bones. It is a rich source of calcium and also contains calcitonin, which helps maintaining proper levels of calcium in the body. Consuming salmon regularly can help you improve your sleep. So, if you are suffering from insomnia, try to consume salmon regularly. This will help you get a good sleep at night, without waking up in the middle of the night. Salmon has the power to relax your mind and body because it contains tryptophan, which acts like a sedative. This is the reason why you get a good sleep at night. If you are trying to lose weight, then include salmon in your daily diet. It is great for helping you lose weight. 100 gm of salmon contains only 208 calories. This is enough to make you feel full for lunch. You can cook salmon in various healthy ways so that it benefits your health. If want to improve your vision without going to the doctor, you can do so by consuming salmon regularly. Salmon can protect your eyes and increase your vision. It not only helps in making you see clearly, but also protects you from various ailments of the eye like dry eyes, macular degeneration and so on. This is because salmon is rich in flavonoids and fatty acids that are very effective for your eyes. Salmon can lift your mood and help you to think better. Salmon is rich in omega 3 fatty acids like DHA, which can increase your memory power and the functioning of your brain. By feeding some salmon to small children regularly, they will be able to concentrate better on their studies. It also helps in keeping them away from various conditions like attention deficiency disorder. Consuming salmon is an excellent way to keep your heart healthy and to have a better cardiovascular system. Salmon is rich in omega 3 fatty acids. This helps in reducing hypertension, heart attacks and atherosclerosis. You can also prevent your arteries from getting blocked by consuming salmon. Another benefit of salmon is that it makes you less prone to inflammation. How to Select and Store Salmon Fish? It is important that you know how to select the salmon and store it, before you prepare salmon at home. You can buy salmon as steaks, smoked, fillets or canned. When you buy fresh salmon, its skin is very smooth and moist. When you select salmon, check its eyes. Make sure that the eyes are dark and clear. If you cannot finish fresh salmon within a few days, then the best way to store it is to keep it in the freezer and freeze the fish. If it is thawed, then you must never freeze it again. Put the first 4 ingredients into a plastic bag and then add the fish to the bag. Marinate it for about 2 minutes. You can turn it a few times. As you marinate the fish, heat a grill pan on an over medium-high heat. Now you have to remove the fish from the bag and remove the marinade. Coat the pan using a cooking spray and then place the fish on the pan. Cook the fish for 5 minutes. As you cook the fish, you can prepare the relish. Use the mango and the rest of the ingredients. Serve this relish on the top of the fish. This dish has a lovely taste. You can serve it with potato wedges and peas. First of all you have to heat the broiler. Now add the first 4 ingredients into a big plastic bag and also add the fish to the bag. Seal the bag and then place the bag in the refrigerator for about 10 minutes. Heat the marinade for a minute or so by placing it in the microwave. Now you have to preheat a large skillet. Add the salmon, salt and pepper evenly. Coat the pan with cooking spray and then place the fish on the pan. Cook the fish on the pan for about three minutes. Turn the fish over and allow it to marinate. Let the fish broil for three minutes and you can test whether it is cooked, using a fork. Your dish is ready and you can serve it. 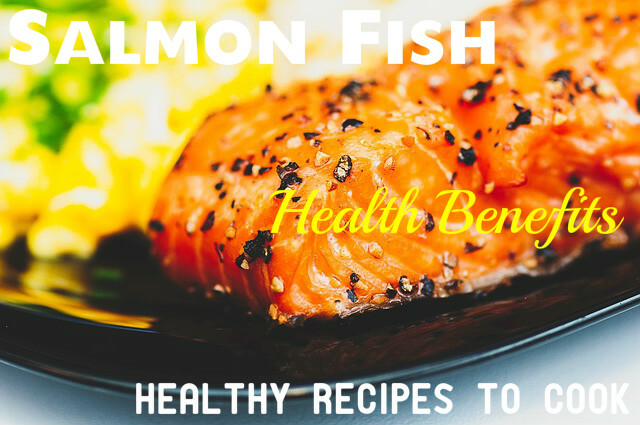 Now that you have seen the benefits of salmon and how to prepare it, include this fish in your daily diet and see how it benefits your health and keep you healthy, energetic and young looking.